I’m a big fan of packing this way. Packing in advance, you have the time to examine each item and decide if it’s really worth the space in the box and on the truck. Is this broken crayon, that old shirt, this puzzle missing half the pieces really something you want to carefully wrap up and transport to your new home? No? Then get rid of it now. In our last move we were not allowed to pack anything ahead of time, so I didn’t weed out much before the Japanese mover power team came and boxed up my house in a day and a half. As a result we ended up taking things like old bills, worn-out shoes, etc. that I would have cleaned out before sealing the boxes. Check your local trash collection website for bulk pick-up dates and be sure to have any large trash items out at that time or you may have to deal with them on the other end of your move. When we moved to Japan we had the same sort of professional packing blitz and a few items of furniture we hadn’t been able to get rid of made the move with us. On the plus side, that dresser made a decent beach bonfire, so it wasn’t all bad! Still, there’s enough to do on the other end without trying to get rid of things you didn’t want to bring with you in the first place. For smaller items that are still useful, start a box or bag to take to a thrift store that accepts donations. If you make sure to always start a new one once the old one is filled, you can toss a item you decide you want to part with in as soon as you think of it and avoid having it get mixed back in with other items. (No sense in doing the same work twice!) 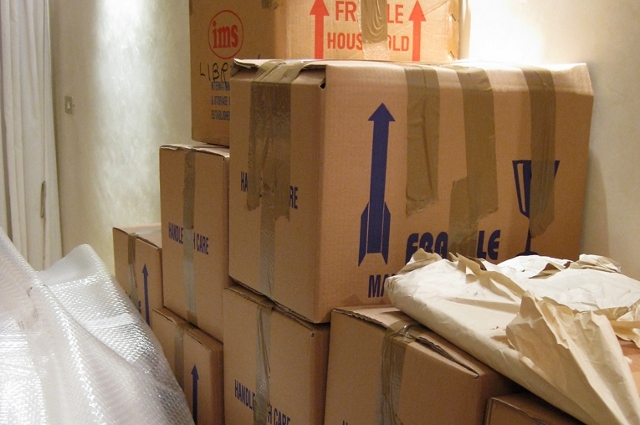 Once a bag or box is filled, get it out of the house ASAP so it doesn’t get stacked with the moving boxes and accidentally get transported to your destination. (Yes… this has happened to us, too.) Plus, I find that the more space gets cleared out the easier it is for me to see what should go next. One thing I learned from military movers is to give each box its own unique number. Keep a list of EVERY box packed with a list of what’s in it so you know where to find things if you suddenly need them. This is an old tip, but I’ve thought of a new one to go along with it. Pretty much everyone has a digital camera of some sort these days, so why not take a picture of what’s inside the box before you seal it up, too? If you write the box number inside the flap (so it’s visible in the photo) as well as on the outside of the box, then you’ll have a photo record as well as a written list, and you’ll never again have to rip open every box with “KITCHEN” written on it just because you need your muffin pan. Did I mention I have some packing to do? See you guys later. This entry was posted in How To, Life in General. Pack a “First Night’s Box” TP, Sheets for naked window treatments, and a change of clothes for everyone. This can usually be done way in advance. so why does my comment have a red faced deamon? Lol! Mom, it’s a randomly generated by the email address you use, I believe. If you try a different email you might get a better face, haha! We were lucky that the housing we were stationed in was furnished so I didn’t have to worry about furniture, but it was still a major interruption to our normal lives. Maybe we’ll get to meet sometime in your new location. We go to Missouri every couple of months. Cheri, that could be fun!